Welcome to the Children in a Changing Climate Website! The Children in a Changing Climate (CCC) coalition is a partnership of five leading child-centered development and humanitarian organisations: ChildFund Alliance, Plan International, Save the Children, UNICEF and World Vision International. We have a commitment to share knowledge, coordinate and work with children as agents of change, in full recognition of their capacity to prepare for and respond to shocks and stressors. 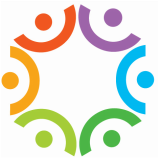 The mandate of the CCC coalition is to advocate for and promote the rights of children in global agreements. "We children will be greatly affected by negative impacts on the environments...we are the future generation! It is important to have understanding of climate change to help us foster a behavioural change in young people worldwide"
"We want to make people understand about the environment. We are creating campaigns for cleaning our community and also making a small theatre production dedicated to our environment, specially focused on deforestation"
"My school applies 5R concept: reduce, reuse, recycle, replant and respect"
"We need to think about our generation before we can start thinking about our kids and grand-kinds"
The Sendai Framework for Disaster Risk Reduction 2015-2030 (Sendai Framework), adopted by Member States at the Third UN World Conference on DRR in Sendai, March 2015, provides a unique opportunity to build on the progress made to date and to address gaps and challenges. It is also an opportunity to align with the Sustainable Development Goals (SDGs), the Conference of Parties (COPs) to the UN Framework Convention on Climate Change (UNFCCC), and the World Humanitarian Summit (WHS), among others. Disaster risk reduction is relevant to 25 targets in 10 of the 17 SDGs, highlighting the need for risk-informed development. While the Sendai Framework reflects many child-centred asks, there remain areas for further action in ensuring children’s rights are upheld before, during, and after disasters, and that children are actively connected and engaged at all levels. For instance, whilst children and youth participation and school safety were recognised within the Sendai Framework, other key issues regarding child protection and child participation in the monitoring and accountability of implementation of the Framework were less visible. ​Continued advocacy is needed for child-centered approaches in the implementation of the Sendai Framework and the active and meaningful participation of children in all aspects of the Framework, particularly in terms of monitoring, and within the wider context of the Agenda 2030 for Sustainable Development. It is now well established that children are disproportionately affected by shocks and stresses related to climate change, disasters, and conflict – and that these risks are becoming increasingly severe, complex, and intertwined across rural and urban geographies. At the same time, governments and non-governmental actors are recognizing the rights and capacities of children to tackle these threats, and to influence and indeed lead decision-making about their own development futures in a changing climate. This paper evaluates how recent global negotiations on sustainable development can support child-centered disaster risk reduction (DRR) and climate change adaptation (CCA). It reviews six global agreements or processes that collectively compose the 2030 Agenda for Sustainable Development: The Sustainable Development Goals (SDGs), The Sendai Framework for Disaster Risk Reduction (SFDRR), The Paris Agreement on Climate Change, the Addis Ababa Action Agenda on Finance for Development (AAAA), the World Humanitarian Summit (WHS), and the Habitat III New Urban Agenda (NUA). The universal agenda aims to protect the rights of all children everywhere to get the best start in life, to survive and thrive, to receive a quality education and to live free from violence and abuse. Putting Children at the heart of the World Humanitarian Summit. UNISDR and UNICEF developed an educational kit called “Let's learn to prevent disasters!" which includes the board game "Riskland". The game conveys messages that help children understand how some actions can reduce the impact of disasters, while others can increase our vulnerability, learning about prevention and preparedness. The Pacific region has been repeatedly hit by severe tropical cyclones, including Cyclone Winston, in the past month. 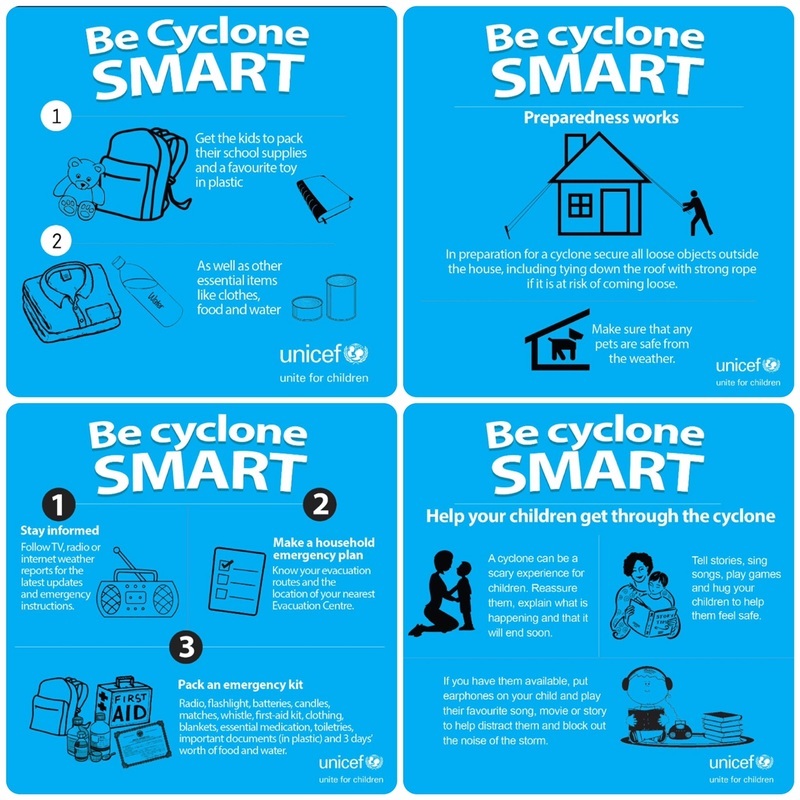 Here are a few simple tips to ensure that all members of your family are prepared to the current Cyclone Zena. As negotiators in Paris worked to agree a new climate agreement under the UNFCCC, it was children’s futures that were at stake. CCC made sure that the voices of children were heard at COP21 through side events at the conference. We also launched our new publication: Child Centred Climate Change Adaptation - Realising children's right in a changing climate, which illustrates a range of child-centred approaches to adaptation. Is the Paris agreement the lightning rod we're looking for? The Sendai Framework was adopted at the Third United Nations World Conference on Disaster Risk Reduction in Sendai, Japan, in March 2015. The Framework aims to prevent new and reduce existing disaster risk. Its targets are aligned with related DRR targets in the SDGs. The framework recognizes the vital role children have to play in reducing risk, strengthening community resilience and shaping legislation to better protect against climate change and disasters. Disasters negatively impact children’s rights, affect poor countries and erode development gains. Under the UN Convention on the Rights of the Child (CRC) children have inalienable rights in all circumstances, including disasters, and the right to participate in decisions that ultimately affect them.